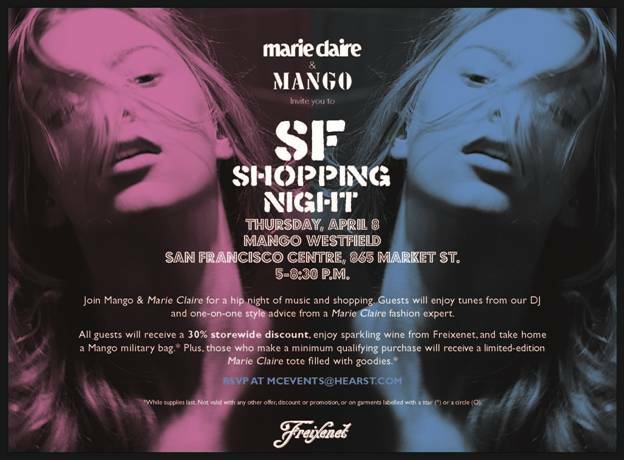 On Thursday, April 8, Marie Claire is hosting a shopping event at MANGO in the San Francisco Shopping Centre (865 Market Street) from 5 to 8:30 p.m. Enjoy a snazzy evening of fashion, cocktails and music. As an added bonus, the entire MANGO store will be 30% off and shoppers will receive a limited-edition tote filled with goodies (for one night only). RSVP to mcevents@hearst.com if you want to attend! Previous Do you want to intern for Yigal Azrouël?